Beachwood in Corton, near Lowestoft, Suffolk sleeps 4 people. 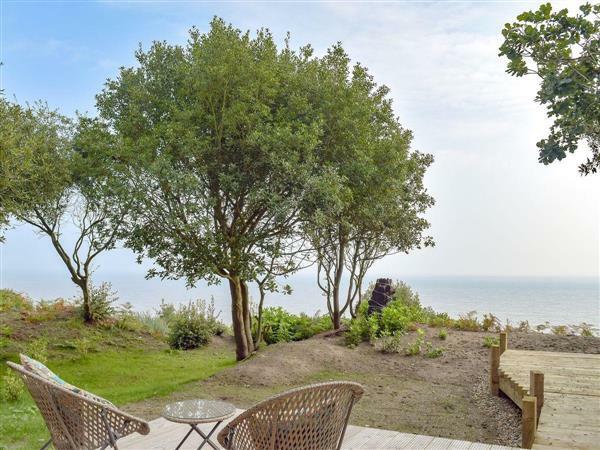 Beachwood near Lowestoft offers uninterrupted sea views from a secluded woodland setting, with decking overlooking the cliff side and Corton Beach. Situated in Corton, just outside Lowestoft, the most easterly point in the UK, guests can enjoy stunning sunrises each morning. The award-winning beach is just below and is excellent in both summer and winter. This detached lodge is ideally located to explore both Suffolk and Norfolk, and coast and countryside are within easy reach. Visit the Norfolk Broads National Park, with its southern gateway, Oulton Broad, just a short drive away, with fantastic restaurants, bars and nightlife. Lowestoft offers shopping, beaches, two traditional piers for family entertainment restaurants offering excellent seafood, or further along the coast, you can explore the town of Southwold. The beach, shop, pub and restaurant are all 500 yards from Beachwood near Lowestoft. Open plan living space: With French doors leading to decking. Living area: With electric fire, 42 Freeview TV and DVD player. LPG central heating, gas, electricity, bed linen, towels and Wi-Fi included. Welcome pack. Decking with garden furniture and barbecue. 1 small dog welcome. Private parking for 2 cars. No smoking. Please note: No children under 12 years old. Holidays at Beachwood run from Friday to Friday. For a better idea of where Beachwood is, you can see Beachwood on the map below. Beachwood is in Suffolk; should you be on the lookout for a special offer, you can find all the special offers in Suffolk. It's always worth checking to see what is on offer at the moment. Do you want to holiday near Beachwood (UKC2475), you can see other cottages within 25 miles of Beachwood; have a look to find your perfect holiday location.